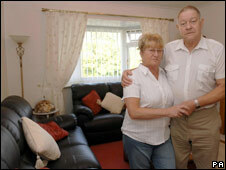 A man who claims chemicals in his sofa caused a serious heart problem is to sue its supplier and manufacturer. Barry Green, from Plymouth, bought the sofa, made by the Chinese manufacturer Eurosofa, from Land of Leather in September last year. The 63-year-old father of four said he started to suffer problems within weeks of buying the £545 leather suite. Land of Leather said the matter was part of ongoing court proceedings and it was unable to comment. "At first I just couldn't catch my breath, I thought it was just a cold or flu, but it just escalated from there," he said. "I'm so angry, this should never have happened. "I was quite a fit guy before and now I'm on so many tablets you wouldn't believe it." The sachets contained the chemical dimethyl fumarate. He said he was taking legal action against both Land of Leather and Eurosofa after the BBC television programme Watchdog said severe skin conditions could be caused by the chemical. A spokesman for Land of Leather said: "As the subject matter of the report is part of on-going High Court proceedings, the matter is sub judice and as a result we are advised by leading counsel that it is improper for us to comment."